The photographs on the left will demonstrate how I developed a composition from reference photographs. The first picture shows the building of the second photo hidden by trees. 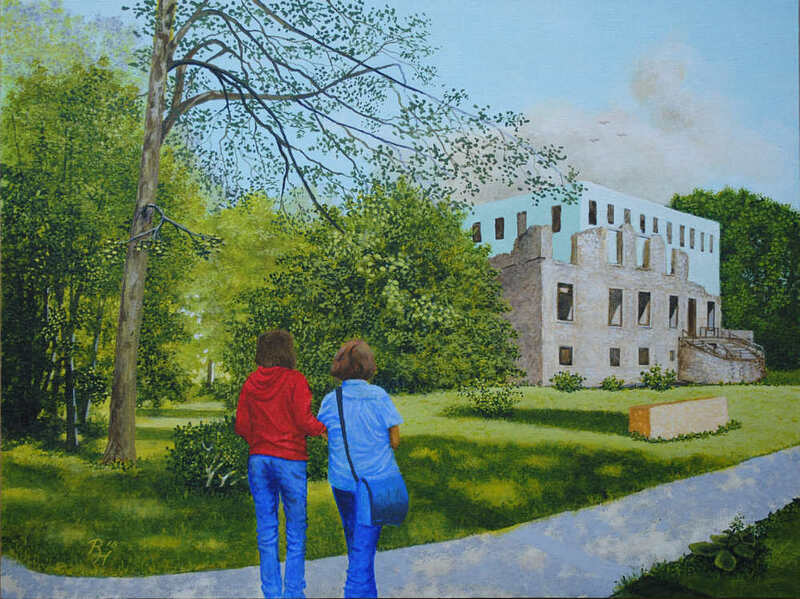 The second picture gives us an impression of the building which I wanted to be the main attraction of the painting. It shows a museum of modern art which was built inside the ruins of an old castle. For my composition I decided to place the museum at the artist´s favourite golden mean rather than at the centre of the painting. The people on the footpath leading towards it add interest to the scene and help to guide the eye. The branches of the tree on the left also point towards the building. I have left out distracting items so the viewer can concentrate on the main subject and still have a lot to explore. The painting is 30x40cm in acrylics on wood. You will find more of my landscape paintings when you click here. For an enlarged view please click on the photo. The original and limited edition prints are available upon enquiry. This entry was posted in acrylic, art, painting, selling art and tagged acrylic, composition, landscape, Museum, painting, painting from photographs, trees. Bookmark the permalink.